UFX offers its responsive ParagonEx platform alongside MT4 and caters to traders through its CySEC-regulated office in Europe alongside its offshore entity in Vanuatu. With fixed spreads across all its account types, low trading costs are not one of UFX’s strong points. Please Note: UFX was not included in the 2019 annual review. As a result, this broker's ratings may be outdated. Read our Best Forex Brokers 2019 guide for a look at the top rated forex and CFDs brokers. Founded in 2007, UFX (formerly UFX Markets) obtained regulation with the Cyprus Securities and Exchange Commission (CySEC) in 2011 under its Cyprus entity, Reliantco Investments Limited, which uses UFX as its trading name. In 2014, the company rebranded from UFX Markets to UFX, to match its brand with the three-letter domain name it had acquired. The UFX brand also has an entity regulated in Vanuatu, under UFX Global, regulated by the Vanuatu Financial Services Commission (VFSC). In addition to offering the popular MetaTrader4 (MT4) platform developed by MetaQuotes Software Corporation, UFX provides ParagonEx, its proprietary trading platform that features charts powered by NetDania. 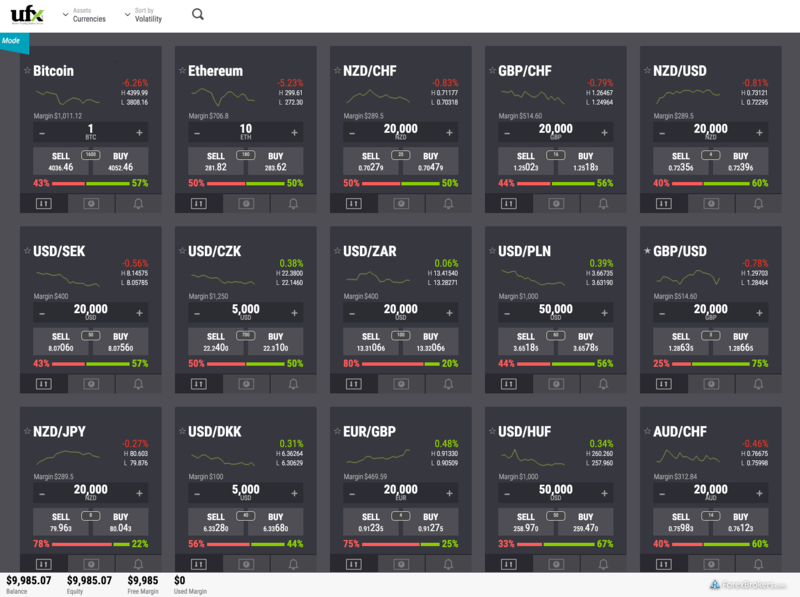 In total, UFX offers traders access to over 500 instruments, including 49 currency pairs and CFDs on 30 cryptocurrencies, eight indices, 45 ETFs, 373 single stocks, five commodity contracts, and 10 expirable futures contracts. Here at ForexBrokers.com, we maintain the largest independent regulatory database available on the web. Using 28 different variables, we have created a proprietary 1-100 score (the higher the better) of overall trustworthiness, which we call the Trust Score. Here is our trust summary of UFX. The following table summarizes the different investment products available to UFX clients. 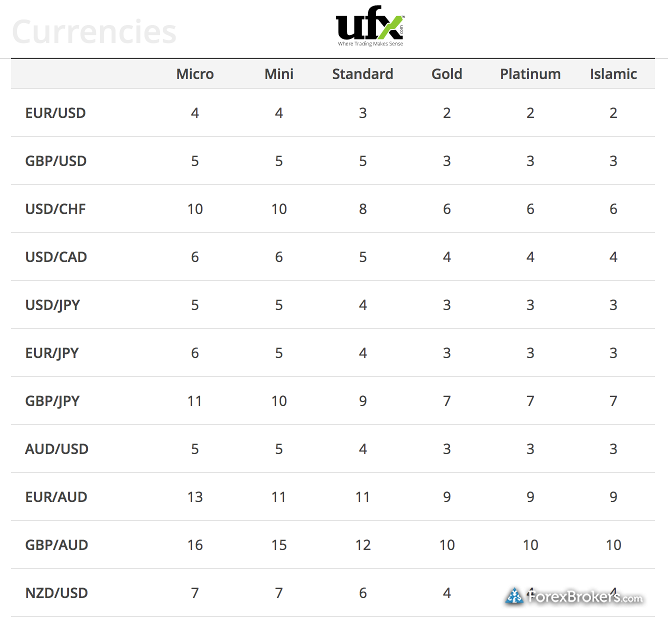 The trading costs at UFX consist of fixed spreads for forex trading and vary depending on the type of account established (there are five accounts to choose from, ranging from Micro to Platinum). To trade the EUR/USD pair at UFX, fixed spreads are 4 pips on the Micro and Mini accounts, then 3 pips on the Standard Account. These drop to 2 pips on the Gold and Platinum accounts. Despite the wide range of account options, including a Sharia-compliant Islamic account offering, trading costs are above the industry average, making UFX an expensive option across its fixed-spread offering. Bottom line: while UFX offers its lowest spreads on its Gold and Platinum accounts, if the broker added a lower fixed spread or variable spread offering, this would help it compete in this category. UFX provides multiple resources for its research offering across its platform and website. 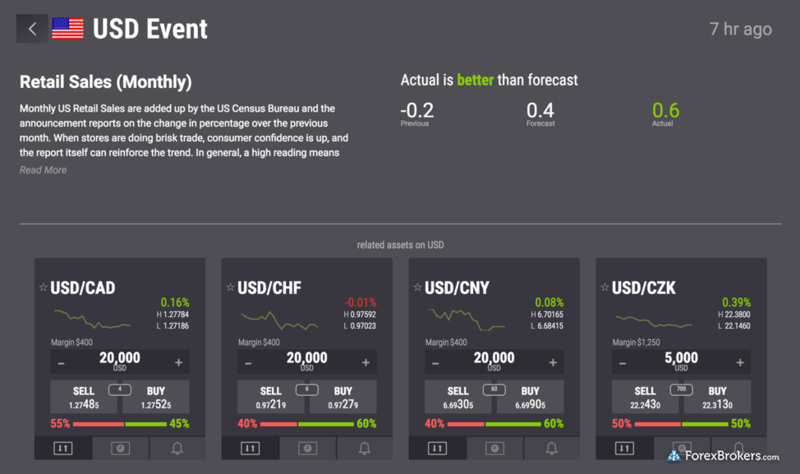 These range from an economic calendar and headlines powered by FXStreet, to its proprietary MassInsights technology that analyzes client sentiment data. 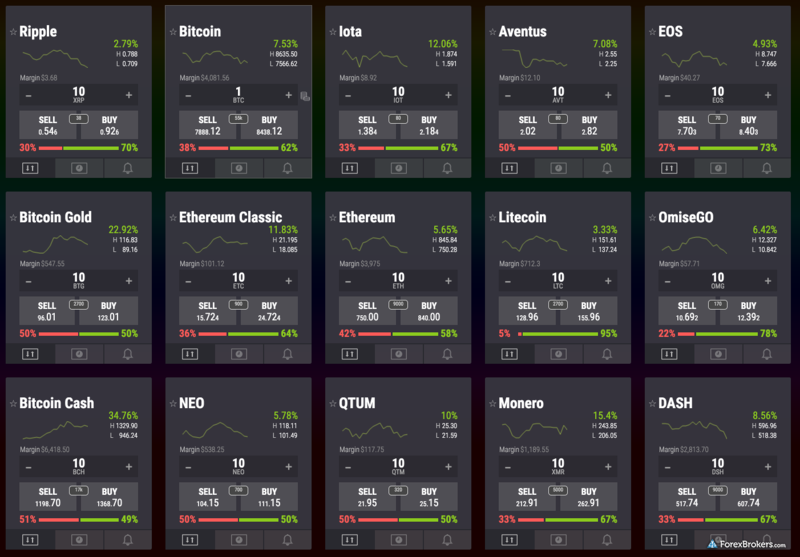 MassInsights deciphers sentiment data in several ways beyond the typical buy and sell percentages displayed, by looking at changes in trading activity, including abrupt turnarounds, sharp spikes in volatility, and more than usual positions being opened by traders on a specific asset, among other sentiment-driven indicators. MassInsight combines research alongside the trading experience on the ParagonEx platform – a welcome feature compared to platforms that have research segmented in a different section. UFX further enhanced its research in 2017 by adding content from Alliance Signals, a trade name of iSignals based in Switzerland, as well as additional content in the form of daily market analysis videos. Overall, UFX finished 19th out of 43 brokers for Research in our 2018 Review. UFX offers the MT4 platform suite from MetaQuotes Software Corporation, developer of the widely popular MT4 and MT5 platforms for desktop, mobile, and web (to learn more about MT4, read our full MetaTrader guide). UFX also offers its own proprietary web-based trading platform, ParagonEX, which is I focused on for this review. UFX has done nicely in creating a highly simplified user interface design in ParagonEx. UFX has done nicely in creating a highly simplified user interface design in ParagonEx. The user experience is also smooth, even though the platform feels too simple initially; however, once the open position tab is expanded from the lower toolbar, managing open trades, including via the close all button, is easy. Another neat feature during order creation is the maximum trade size you can make for the selected instrument. This is based on the available margin in the account and the selected leverage. With the ability to sort across six available asset classes using various filters such as volatility and daily change, the watch list in ParagonEX acts as a screener for users. Users can also add favorites to the default “My Assets” watch list (instruments are added automatically each time a new position is opened). Positive aside, one primary weakness to security monitoring is there is no ability to create additional watch lists. 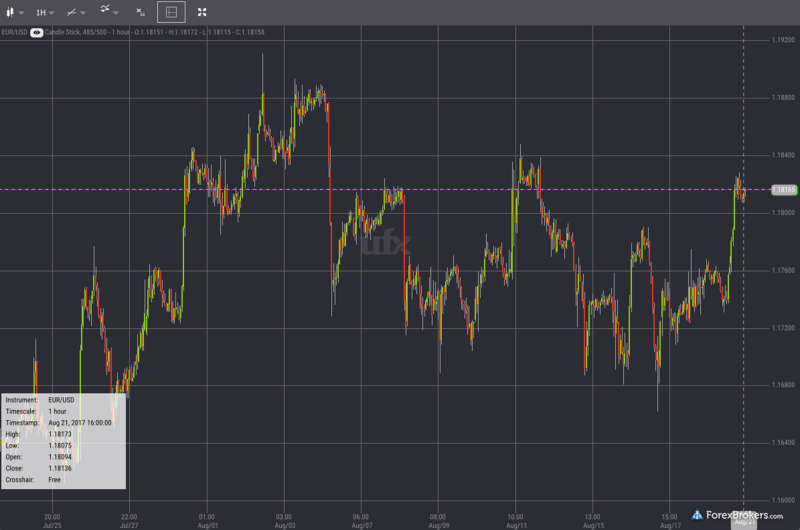 Moving to charting within the ParagonEX platform, charts powered by NetDania come loaded with 53 indicators and 21 drawing tools that can be used across a dozen time frames and just as many chart types. In addition, zooming in and out and compressing prices vertically was a very fluid process. The only drawback with charting is the inability to switch instruments from within the chart windows, as a new separate window must be opened manually. Overall, traders looking for a simple trading solution alongside integrated news and analysis tools may find the ParagonEx web platform suitable, while more advanced traders may find the range of order types limited and choose from the firm’s MT4 offering as an alternative. UFX finished 19th for Platforms & Tools in our 2018 Review. 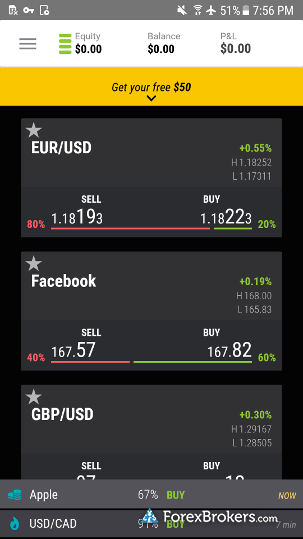 UFX offers the MetaTrader 4 mobile app, alongside its ParagonEx mobile app, and both have available iOS and Android versions available for download from the Apple iTunes store and Android Playstore, respectively. For this review, I focused on the ParagonEx mobile app for Android running on a Galaxy S6 Smartphone. It’s worth noting that the mobile app defaults to a live account, requiring users testing the demo version to go into the settings to switch to demo mode. Upon logging in to the ParagonEx mobile app, also known as UFX Trader, the layout and navigation resembled the web version of the platform, with syncing watch lists and a simple UI design. Looking at charting, the experience was improved significantly since our review last year, with 63 indicators and 9 drawing tools now available in landscape mode. All in all, the ParagonEx app has a good foundation and provides an experience that is consistent with its web counterpart. UFX finished 13th in our 2018 Review for Mobile Trading. In 2017, UFX expanded its range of cryptocurrency CFDs to a total of 30 crypto assets, making it one of the most extensive crypto offerings we saw while conducting our 2018 Review that included 43 forex brokers. UFX provides execution on an agency basis, and as per its best execution policy, its sole execution venue is PXExchange Ltd, which is licensed by the International Financial Services Center (IFSC) in Belize as a List F “Trading in Securities Services” broker. The broker offers a reasonable range of forex pairs, and significantly boosted its range of CFDs across ETFs, Single-Stocks, and Cryptocurrency CFDs. In 2018, UFX provides a crypto trading experience that is rivaled only be Swissquote. Perhaps the biggest drawback with UFX – besides some small bugs on the mobile app – is its pricing options, with only fixed spreads available across all its account types. Considering that spreads across all its offered accounts types are generally high, this makes UFX less flexible than brokers offering variable spreads for price-sensitive traders. Nonetheless, traders that have execution-sensitive strategies or who are not as cost sensitive may find the Gold and Platinum accounts more favorable, as fixed spreads are comparably lower than the other account types, helping UFX cater to a specific trader segment. Select one or more of these brokers to compare against UFX. *UFX did not participate in the 2017 Online Broker Review, as a result the following data may not be up to date. Micro: Fixed spreads of 4 pips on the EUR/USD pair. Mini: Fixed spreads of 4 pips on the EUR/USD pair. Standard: Fixed spreads of 3 pips on the EUR/USD pair. Gold: Fixed spreads of 2 pips on the EUR/USD pair. Platinum: Fixed spreads of 2 pips on the EUR/USD pair. Islamic: Fixed spreads of 2 pips on the EUR/USD pair. 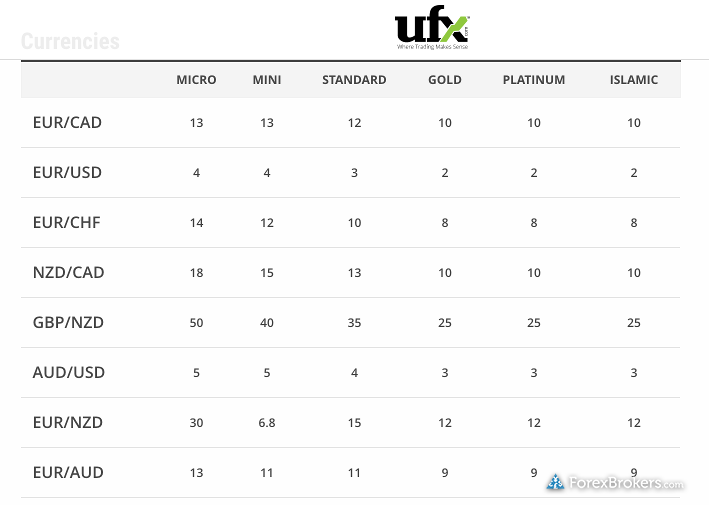 Find out how UFX stacks up against other brokers.